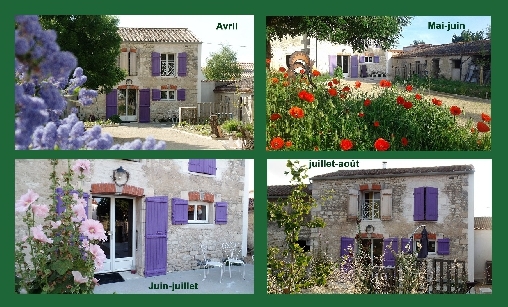 The “Collégiale” guesthouse is in Clavette, near La Rochelle (Charente-Maritime) in the heart of the Aunis province, close to the islands of Ré, Aix and Oléron, the town of Rochefort and “Green Venice” (the Marais Poitevin). Come and enjoy a nature break near the seaside and in the countryside: we provide bed and breakfast and evening meals and propose to live an experience out of time whatever the distance from you. 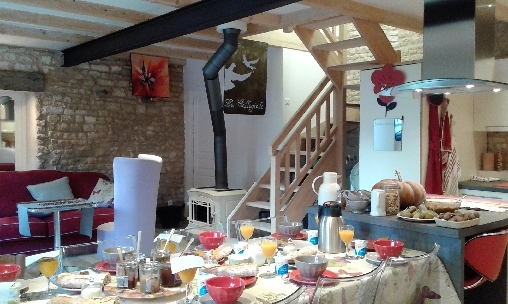 The Nest of the "Collégiale" is an independent cottage offering two luxury guest rooms. The living room, is available to guests. Television and cable internet are available in the living room. Wifi will be made available on request if everyone wants it. 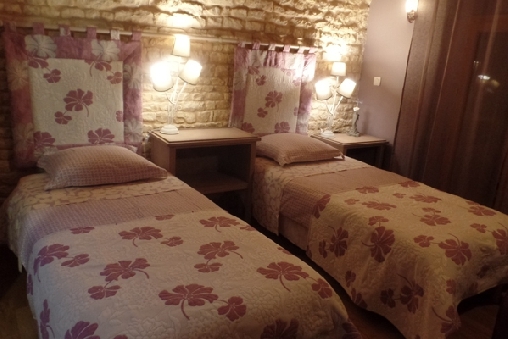 An original, customized room built around the swallow's nest which has been preserved. A tree-shaped bookcase goes up to the beam to which the nest is attached. The cotton satin sheets fit a King size bed. 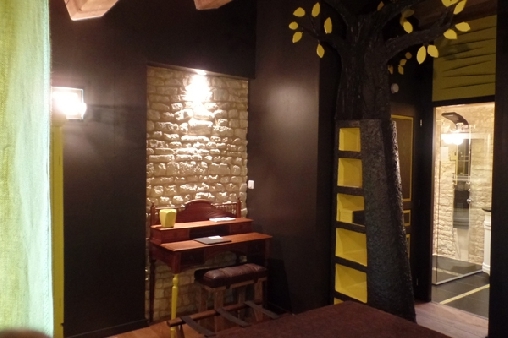 There is a small mahogany desk with a leather seat, a little cabin wardrobe and a small clothes tree uder the clock. 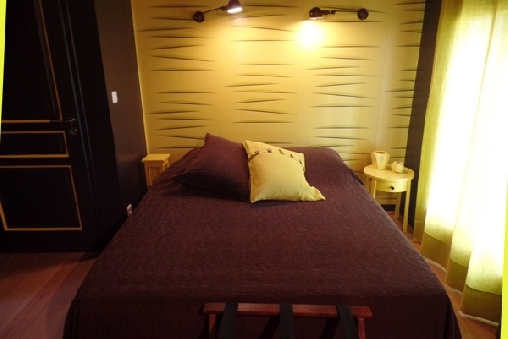 The articulated lamps above the bed let you select direct or indirect lighting. 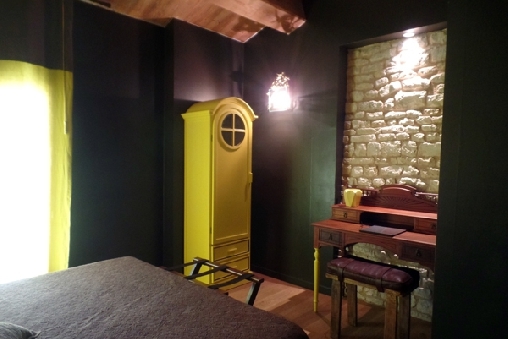 The yellow and brown linen curtain and the natural oak flor complete the very cosy atmosphere. 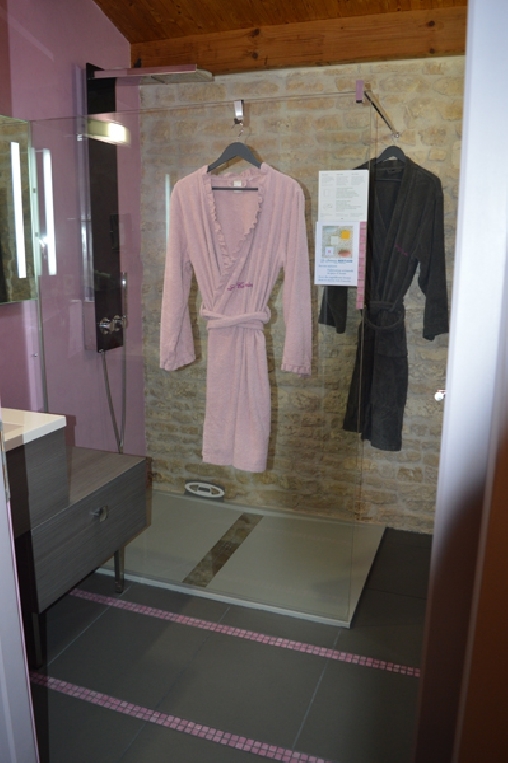 The swallow room has a spacious bathroom with a 35x57" shower unit equipped with a set of invigorating water jets and a delightful waterfall for relaxation. A hair dryer, a magnifying mirror, paper hankies, cotton buds, and organic soap and shower gels are provided free of charge. The soap is handmade in the Aunis province from natural local ingredients. Click here to check the department’s weather forecast (Charente-Maritime). Temperature, rainfall, sunshine, wind, satellite image, etc.. Click here to learn about the features of this department’s climate.